Kluno: Hero Battle is a player vs player hero arena developed by Chorus Worldwide Games. 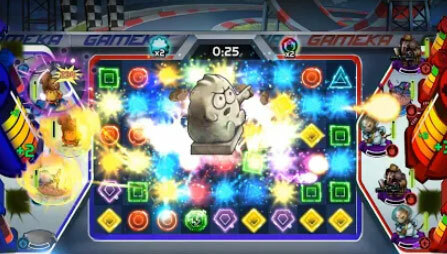 The battle is controlled by a match-3 game board. Collect, upgrade and form the best team of five to destroy the enemy team and their base. Challenge the traditionally casual game play of puzzle matching by instead matching fast and managing a team of heroes. React quickly to the situation of battle or lose your ranking in the leader boards. Make matches quickly to charge up your heroes and destroy your enemies with epic powers. Discover and collect an arsenal of items to assist you in battle. Worry not about depleting your inventory as items come in surplus. Each item has a unique purpose; try them all and build your strategy accordingly. If you get stuck in the game, check out the video walkthrough and gameplay for the game. This entry was posted in Android Games, iOS Games, Mobile Games, Walkthrough and tagged Kluno: Hero Battle Cheats, Kluno: Hero Battle Game, Kluno: Hero Battle Gameplay, Kluno: Hero Battle Guide, Kluno: Hero Battle Hints, Kluno: Hero Battle Review, Kluno: Hero Battle Solutions, Kluno: Hero Battle Strategy, Kluno: Hero Battle Tips, Kluno: Hero Battle Walkthrough by Marvin. Bookmark the permalink.